Very reasonably priced for the amount of sand and colours, my son loves playing with and creating different textured pictures. Will purchase again but these will last us a while! 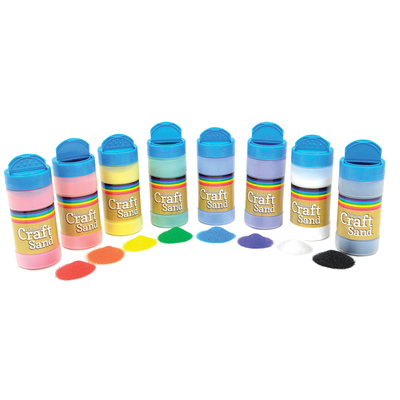 Merge messy play with crafting when you introduce this Coloured Craft Sand Assorted 8 Pack to your store cupboard. With 8 vibrant and rich colours to choose from, these individually packed pots can be sprinkled together or used independently to add texture to paints or simply as a sensory tool for smaller children. Featuring a double sided lid that both allows for light sprinkling or heavy dumping, each 300g shaker is slim enough to be used by smaller hands while also offering a limiting option to prevent over use. A great tool for sensory play, allow your class to run their fingers through all the different colours of craft sand while mixing together their favourites for a unique and striking result. Keeping in theme with Arts and Craft material, we also stock other store room essentials such as our Coloured Wooden Jumbo Lolli Sticks, A4 Cellophane Sheets Assorted and our Gompels Washable PVA Glue 5ltr.